Where to go if you’re not cooking this year (or you’re delayed at O’Hare). You didn’t make plans, so what should you do? Don’t panic, there are great restaurants that don’t take reservations anyway. There are a lot of great brunch spots around, but these should be at the top of your list. It’s hard to come to terms with the fact that something you used to like isn’t the same. For example, when your friend studies abroad for two months and comes back with a fake accent, or your favorite actor takes a role in Transformers 27: Meet The Parents. At first you try to make excuses for them, but eventually it’s impossible to ignore the fact that things are different now. 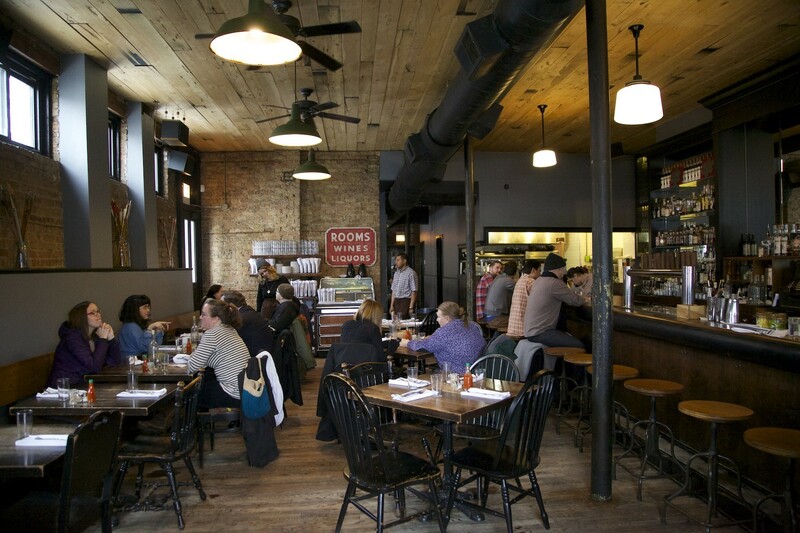 This is how we feel about Longman & Eagle in Logan Square. It used to be a great restaurant serving thoughtful and well-executed dishes. But since it lost its original chef, the food has been inconsistent, poorly thought out, and simply not as good. Having a meal at Longman & Eagle has always been a bit of an ordeal. It was one of the first upscale gastropubs in Chicago (before we had one in every neighborhood), and didn’t take reservations. In the early days, you could expect long waits and hit-or-miss service - but also fantastic food that made eating there worth the hassle. All of this still true, except the part about the food. At first glance, Longman’s menu looks the same as it always did, with a lot of bone marrow, pig jowls, and game. But the dishes don’t come together very well. There’s Cornish hen pot pie with pastry the texture of a stale tortilla, and too-large vegetables that are really undercooked. The lamb neck tagliatelle has way too many ingredients, and ultimately fails on a few levels: the noodles are gummy, the lamb flavor is overpowering, and it’s topped with cold burrata that doesn’t mix in easily. The old menu staples aren’t quite right, either. The soft pretzel is dense, dry, and served with a mustard beer butter that’s nowhere near as good as the cheese sauce this dish used to have. Same with the bone marrow, which now comes with diner-style toast that’s way too thin and soft to hold its own. Some dishes are OK - for instance, their burger is still solid. But Chicago has even more decent burgers than it does gastropubs. One thing Longman still does really well is provide a comfortable place to get together. The dark interior, large wooden bar, and excellent whiskey cocktails are exactly what you want when it’s 11 degrees outside, and during the summer, the patio area, with plenty of tables and a separate bar, is equally ideal. If you treat this place like a great bar with a reliable burger, it’s still a good neighborhood option. Longman has been around since 2010, and in restaurant years, that’s a long time. It was one of the first Chicago bars that cared about having interesting, high-quality food. But you can’t win this year’s Oscar with last year’s movie, and unfortunately, it doesn’t matter how Longman used to be. The truth is, things have changed. The original incarnation of this thing was magical. It was soft on the inside, crispy on the outside, and served with a cheese sauce delicious enough to eat by itself. The new pretzel is roll-shaped and really dense, with a dijon beer butter that doesn’t taste a whole lot like butter, beer, or dijon. It just doesn’t work. This used to be a standout dish, in part because of the bacon jam it came with. Luckily, the jam is still there, but now there’s also a chimichurri sauce that isn’t as good. The sourdough toast doesn’t hold up to the marrow, making it a disappointing plate overall. This is a huge mound of pasta with lamb neck ragu and rapini, all topped with burrata. The noodles are inconsistent, the flavor of the lamb neck is overpowering, and the rapini adds bitterness that doesn’t help. The cheese is too cold to incorporate into the dish, and the entire thing is covered in hazelnuts. Nope. The Cornish hen in this pot pie is cooked just fine, but the vegetables (carrots and potatoes) are too large and undercooked, and the only thing you can really taste is the garlic cream sauce. The pastry has no flakiness and it’s hard to eat. There have never been a lot of vegetarian entrees on Longman’s menu, but there’s always been a version of this cauliflower dish. It’s a pile of roasted cauliflower on a bed of lentils, with raisins and a yogurt sauce. Other than the fact that some of the florets are either under or over-cooked, this dish works. The burger, with cheddar cheese and bacon, is solid. But there are a lot of good burgers in Chicago. Son Of A Butcher is a spot serving solid bar food in Logan Square. Wyler Road is a great sandwich spot that you want to sit and hang it. It feels like a cafe during the day and a fancy local dive bar at night. Boeufhaus is a different kind of Chicago steakhouse. It's small, loud, cool, and still serves excellent steaks. Uncle Mike's Place is a West Town diner with a Filipino twist. Somerset is a restaurant in the Gold Coast serving excellent American food that you should be eating immediately. Like Brian Urlacher's former coverage skills or Dennis Rodman's hair, Dusek's has range. 25 Degrees is a solid, dimly-lit burger and beer kind of spot in River North. We approve. Charlatan feels like a designer hunting lodge. Come for the beers and pastas, stay for the pig head.